Which ones would you pick up? A friend asked me the other day to explain how mimicry can play a role in evolution. This is my attempt to do so. Batesian mimicry. Named after the English naturalist Henry Walter Bates. This is where a harmless species evolves to resemble a harmful species if it and the harmful species share a common predator. Müllerian mimicry. Named after the German biologist Fritz Müller. This is where two harmful species evolve to resemble one another if they both share a common predator. The distinction is further complicated by the fact that the mimicry is seen from the point of view of the predator and need not be too readily apparent to a human eye. It is also quite possible for the same species to be a Batesian mimic in respect of one predator and a Müllerian mimic in respect of another. Seeing the mimicry from the predator's point of view is obviously key to understanding how mimicry works. Bear in mind also that a predator might not have colour vision so whatever works in shades of grey will suffice. Some predators may even see in ultraviolet or infrared, so mimicry can be operating outside our own perception altogether. Key to understanding how it evolves is understanding the fundamental basis of evolution - natural selection incidentally 'favouring' those small variations which produce more descendants so the genes for those small variations increase throughout the population's gene-pool over time and no matter how unlikely the original mutation was, it will become increasingly common in the gene-pool. You also need to understand the basic economics of the trade off between the risk of being bitten by a poisonous snake, getting badly stung by a wasp or bee, being poisoned by eating a poisonous meal or even being eaten by another predator, and getting a meal. In almost every case the 'cost' to the predator of being killed, injured or made sick is far greater than the cost of missing a meal so the tendency will be for the predator to be highly risk-averse. Where the predator has alternative food, the evolutionary pressure on it to improve its ability to tell the mimic from the comimic might not be that strong so the mimic gets away with only a passing resemblance. This difference is reflected in the different intensity of selection pressure on predator and prey. Although once thought to be an example of Batesian mimicry, it has recently been discovered that the viceroy butterfly (top) is actually more unpalatable than the monarch butterfly (bottom), making this a case of Müllerian mimicry. Imagine a situation in which a harmless fly is preyed on by a bird which is also a potential predator on a stinging wasp. The bird will quickly learn to avoid anything that resembles a wasp. Indeed, over time, it may even have evolved a natural reflex avoidance so it doesn't even need to learn by experience. Imagine now a few flies in the population occasionally having a mutation which, for example, gives them a yellow tip to their abdomen or a yellow stripe across the centre of it, or maybe a yellow thorax - anything which a bird in some situations might mistake for a wasp. This will give the mutant form a slight edge over the normal forms so it will leave more descendants on average than the normal form and the mutation will, over time, become the norm in the population. It's easy to see how even something that works in poor lighting or only on those birds at the lower end of the range of visual acuity for the population - maybe the oldest or the youngest - and the environment will slightly favour the mutant flies. It's now in the interests of the bird's genes for it to learn to tell this mutation from real wasps, otherwise its former food supply will not be available to it, so natural selection will favour bird genes which enable the bird to tell the difference. Meanwhile, there will now be renewed selection pressure on the fly to overcome this recognition ability by even more closely resembling a wasp. And so we have a classic arms race developing which is driving the fly ever more closely to resemble the wasp and the bird to become ever better at telling the difference. However, the bird may well also have alternative prey species so there is far less selection pressure on it than there is on the fly. The bird only misses a mean and has an alternative; the fly loses its life and fails to pass its genes on. For another example of this, see Seeing Eye To Eye With A Butterfly, an earlier blog of mine on how the peacock butterfly came to have what look like mammalian eyes on its wings. Mimicry need not be confined to visual mimicry either. Some bats find the taste of tiger moths distasteful and tiger moths have evolved to produce a sound audible to bats when they hear the bat's echolocatory signals so the bats avoid them. Some other insects have now evolved to mimic these tiger moth sounds. There may be a whole world of auditory mimicry of which we are hardly aware, including in the sea and rivers where dolphins use echolocation extensively. What we have here of course is the classical situation of a change in the environment of one species being caused by a change in another. 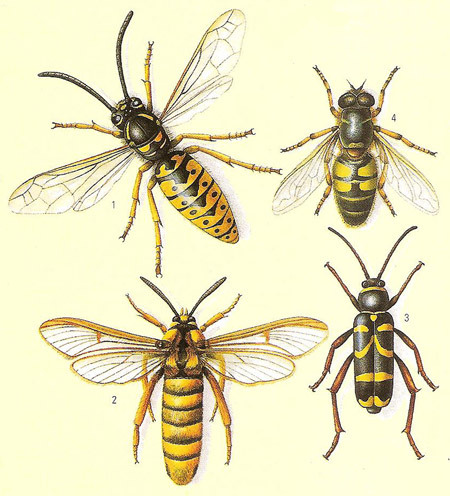 In the absence of a predatory bird, yellow stripes on a fly could not have meant, "Avoid me I might be a wasp". In the absence of wasps, they might have meant, "Look! Here I am! ", to a predator with no reason to distrust yellowish things, and so would have been quickly removed from the gene-pool. The same mutation with the same information can have entirely different meanings in different environments and the meaning is constantly changing in a dynamic environment. The same mutation can either be advantageous, detrimental or neutral entirely dependent on environmental context. This could even hold true for the same species with a continuous gene-pool over a wide geographical range, so evolutionary pressures favouring one mutation in one part of the range could be countered by different pressures favouring the normal gene in a different part of the range, so a gradient or 'cline' can develop giving geographical variation in the same species. And of course it's always possible that a species now has a pattern evolved millions of years ago in the presence of a long-extinct predator or a long-extinct comimic. Since colours don't fossilise well we may never know what benefit the species got from a particular pattern when it first evolved it, so it may not be recognised even as evolved mimicry. It's probably too easy a target to point out how none of this makes any sense as the design of an intelligent designer, since each side of an arms race only makes sense when seen from the narrow perspective of one side or the other, never both, so I'll just challenge creationists to explain how mimicry can be explained in terms of intelligent design by a benevolent designer and how the change in meaning of information by environmental change fits in with the creationist dogma that no new information can arise by mutation. For me evolution is more fascinating to study and ponder than reading the Bible or the Koran and their silly and naïve creation stories. Just an example of interesting link tips: Rosa Rubicondior (who started up the discussion group) has recommended this link which is sort of a portal to many other articles abot evolution: http://www.newscientist.com/article/dn13620-evolution-24-myths-and-misconceptions.html#.U9P5hfmSxmO . By clicking that link you'll find lots of other articles about evolution, in the New Scientist. Now back to this particular blog article written by Rosa Rubicondior (se above). Her last paragraph goes: It's probably too easy a target to point out how none of this makes any sense as the design of an intelligent designer, since each side of an arms race only makes sense when seen from the narrow perspective of one side or the other, never both, so I'll just challenge creationists to explain how mimicry can be explained in terms of intelligent design by a benevolent designer and how the change in meaning of information by environmental change fits in with the creationist dogma that no new information can arise by mutation. She's so right. Here is one article from the New Scientist debunking the creationist myth/lie that mutatíons can only destroy information, not add any new information or behavior; and thus supporting strongly what Rosa has to say about mutations. Check out http://www.newscientist.com/article/dn13673-evolution-myths-mutations-can-only-destroy-information.html#.U9P67PmSxmM . Thank you for the shout out for the FB group Why Atheism.